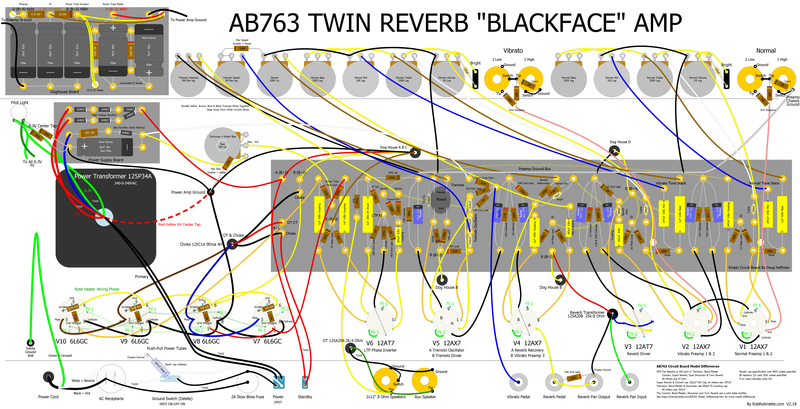 The non-electronic tech's guide to understanding the classic AB763 blackface circuit. 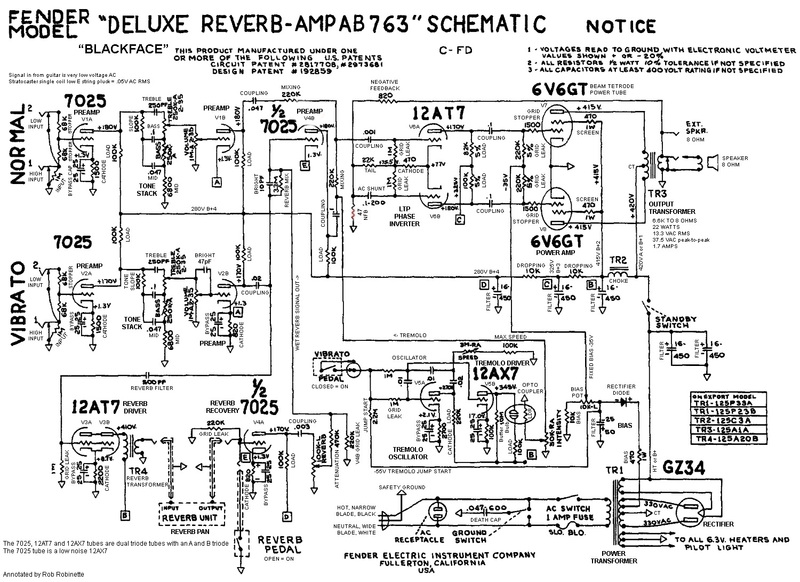 'AB763' was Fender's internal model designation for the 1963 blackface circuit. The "763" in the model name comes from the circuit change date of 7-1963. It was used in the Deluxe Reverb, Twin Reverb, Super Reverb, Bandmaster, Showman, Pro, Vibrolux, Vibroverb, Tremolux and no-reverb Deluxe. The Deluxe Reverb sold for $239.50 in 1965 and that's $1880 in today's (July 2017) dollars. I will try my best to give a not-too-technical explanation of how the amp circuit works, what each component does, and how changing those components will affect the amp's voice. The "blackface" nickname comes from the control panel color. I recommend you take a look at my How Tube Amps Work and How Vacuum Tubes Work webpages for a detailed explanation how vacuum tubes work in the very simple Fender 5F1 Champ. I won't be going over tube theory and other introductory material here so check it out if you have trouble understanding this webpage. Here's my AB763 Modification page. 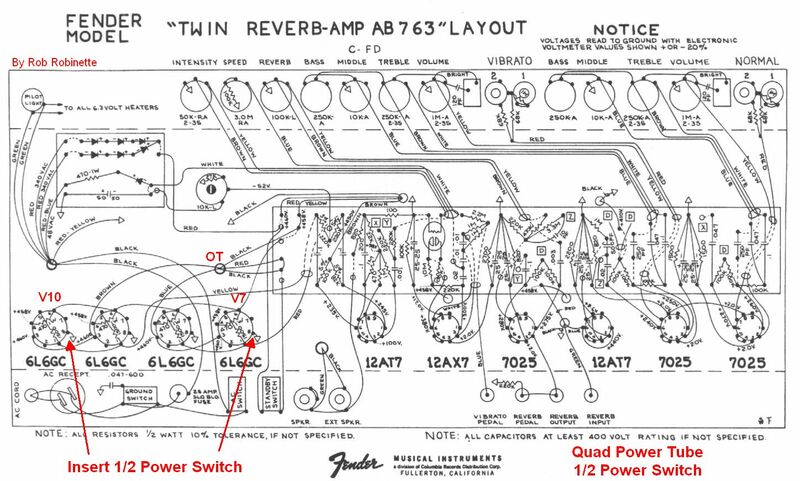 See these links for information on AB763 Model Differences and the evolution of the Fender Deluxe and Deluxe Reverb circuit. I also have a page dedicated to the magical 5F6-A tweed Bassman amp and the ever popular 5E3 Deluxe. Controls in front, Circuit Board inside, tubes on bottom and out of view. The Power Transformer and Output Transformer are attached to the bottom of the chassis. Photo and chassis by Marsh Amps. Some of the elements that give the AB763 Deluxe Reverb such a ubiquitous voice are its mid scoop tone and loud and clear, but not too sterile character, especially when compared to its tweed predecessors. This trait also makes the AB763 circuit very pedal friendly--it can play loud and clean to let the pedals do their thing. The AB763's clean, clear tone comes from the use of lots of negative feedback. The Deluxe Reverb is known for its under rated power supply which gives the amp a lot of feel and touch response but leads to a loose low end and even "farting out" at very high volume settings. The other AB763 amps like the Twin Reverb have higher output power supplies that do not suffer from the Deluxe Reverb's loose low end. You can firm up the Deluxe Reverb with a larger first filter capacitor or even an upgraded power transformer but you will lose some of its touch sensitivity and playability. The AB763 blackface tone is known for its "mid scoop." The TMB (Treble, Mid, Bass) tone stack sets this mid frequency scoop. With the Treble and Bass tone controls set to minimum the tone curve is relatively flat but the guitar signal is losing about 25dB to the tone stack. This is what's meant when people say the TMB tone stack "loads down" the signal. The Mid control is set to 6.8k to simulate a fixed 6.8k Middle Resistor. Graph is from the excellent and free Duncan Tone Stack Calculator. With the Treble and Bass tone controls set to maximum the tone curve clearly shows the mid scoop. See How the TMB Tone Stack Works for more info on the tone stacks. The Vibrato Channel in the AB763 is very different from the Normal Channel, so much so that many AB763 players never use the Normal Channel. The Vibrato Channel has the Normal Channel's topology but adds the reverb and tremolo (vibrato) effects into the signal chain and has another preamp gain stage to make up for losses incurred by the reverb and tremolo circuits. The extra gain stage (triode V4B) more than makes up for the loss and the Vibrato Channel ends up being the higher gain of the two channels. The AB763 Deluxe Reverb's slightly undersized output transformer creates output volume compression at high volume levels which adds to touch sensitivity and sustain. Couple this compression with the voltage sag caused by the undersized power transformer and the Deluxe Reverb sounds a little spongy and more "tubey" than the other AB763 amps. The AB763's fixed bias power tubes sound clean, punchy and loud compared to earlier Fender cathode biased amps. Its long tail pair (LTP) phase inverter can drive the 6V6 power tubes to full distortion at high volume settings so it offers up plenty of power tube distortion. 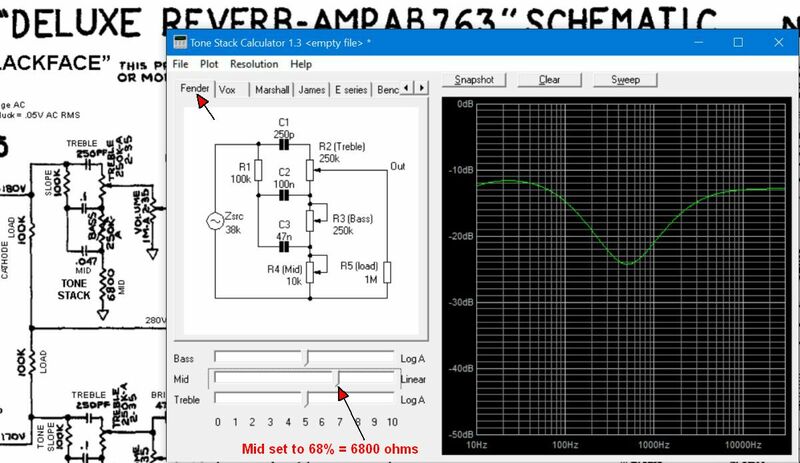 From a modern perspective the AB763 amp circuit is a benchmark which set the Fender standard so high that all of the following circuit changes failed to significantly improve the design. Most Fender aficionados consider the AB763 circuit to be the Fender high water mark. The amp's signal flow in the schematic below is shown by the thick red line from the Vibrato input jack on the left to the speaker at upper right. Signal path above is shown by a thick red line. Signal enters at the Vibrato Hi input jack at left and ends at the speaker at upper right. The guitar signal flows through the first preamp gain stage (V2A), the tone stack, volume control and the second gain stage (V2B). Then the signal is split and flows down to the Reverb circuit to be converted to the wet reverb signal. The signal also flows up to the 3.3M Reverb Mix resistor and the wet reverb signal is injected into the dry signal on the downstream side of the resistor. A third preamp gain stage (V4B) amplifies the signal again and pushes it through the 220k channel mixing resistor and on to the long tail pair phase inverter (V6A & B). The phase inverter creates two mirror image signals to feed the two power tubes V7 & V8. The power tubes' output simultaneously push and pull the guitar signal through the output transformer where the very high signal voltage is traded for current to feed the speaker voice coil. Notice how convoluted the signal path is in the amp compared to the schematic at top. Signal enters at the top at the Vibrato #1 input jack, flows along the red path down to the tube V2A preamp1 for its first stage of amplification, then up the yellow path to the circuit board, on to the treble pot and tone stack, over to the Vibrato volume pot, down to the tube V2B preamp2 for its second stage of amplification, up the purple path to the reverb mix resistor, then down to the 7025 V4B preamp3 for its third stage of amplification, then up the green path to the circuit board, then down to the phase inverter tube where the signal is amplified again and split into two opposite phase signals for the two power tubes. The red path flows to the right 6V6GT power tube then on to the output transformer primary winding, the yellow path flows to the left 6V6GT and on to the output transformer primary. The signal then flows from the output transformer secondary to the speaker jack at bottom center. Click the image to view the full size layout signal path. A PDF version is here. 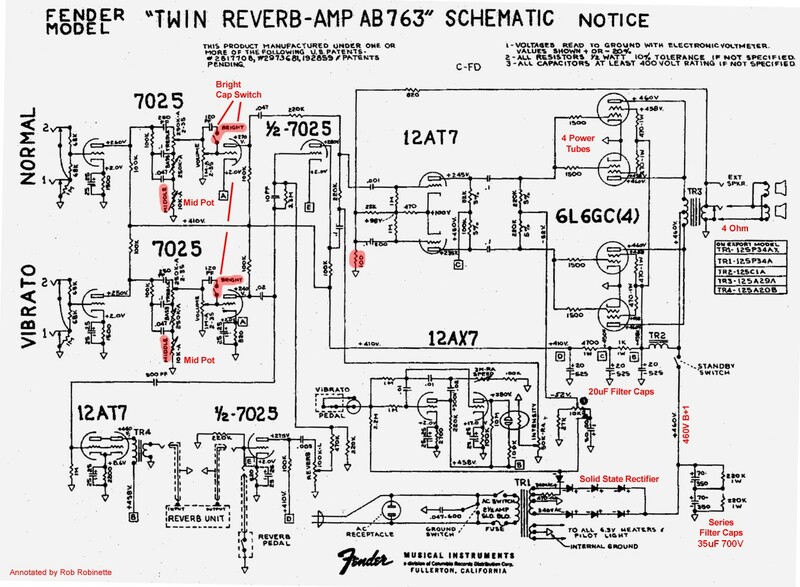 Take a look at my annotated version of the original Fender schematic below for a broad overview of the amp's function. Every component has its function labeled. In the following paragraphs we'll dive deeper and examine individual components and their value tweaking. To see the larger, readable version of a diagram on this page just click on the diagram. Every component has its function labeled. 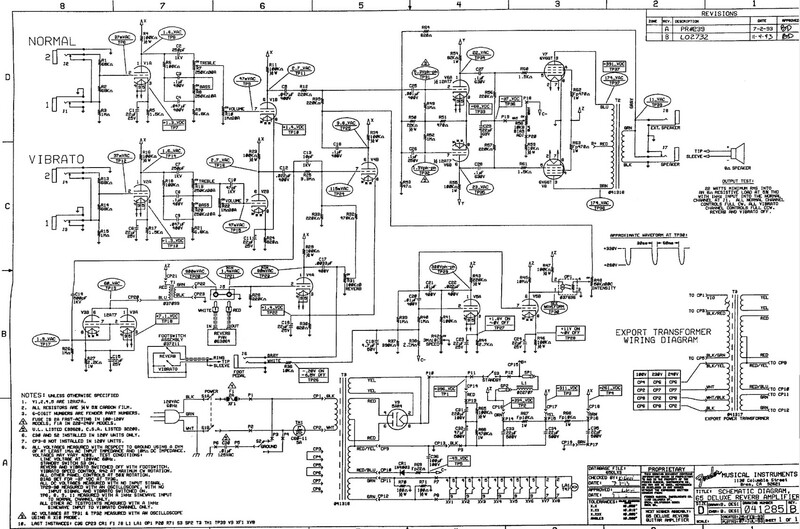 Click the image to view the full size (readable) annotated schematic. A PDF version is here. The Input Resistors act as tube V1A and V2A’s grid leak resistors. The volume pots act as the tube V1B and V2B's grid leak. Load resistors transform the amplification stage from current to voltage amplification. Coupling capacitors block the flow of high voltage DC but pass the AC guitar audio signal voltage to the next amplifier stage. Cathode resistors set the cathode bias voltage. Cathode Bypass capacitors allow signal voltage to bypass the cathode resistor to boost gain. The Output Transformer steps down voltage but steps up current to drive the speaker voice coil which is a simple electromagnet. Input : V1A preamp1 : tone stack : volume pot : V1B preamp2 : V6 LTP phase inverter : V7 & V8 fixed bias power amp. This leads to a fairly high gain channel but it is lower in gain than the Vibrato Channel. The high gain nature of the amp is subdued by the high load tone stack and copious use of negative feedback. Do You Use Your Normal Channel? Many AB763 players never use the Normal Channel since it has lower gain and no effects. If you don't use it you should consider changing it into a "lead" channel. See my Lead Channel Mod for more info. Routing the Normal Channel through the reverb and tremolo effects is another mod that will make the channel more useful. There are four big differences between the AB763 Deluxe Reverb and the 5E3 tweed Deluxe--the blackface tone stack, the long tail pair (LTP) phase inverter, a negative feedback loop and higher output fixed bias power tubes. The 1950's tweed Deluxe and AB763 Deluxe Reverb both have two fully bypassed preamp stages but the blackface tone stack loads down the signal so the preamp is not nearly as hot as the tweed's. In other words the tone stack bleeds a lot of guitar signal to ground, even when all tone controls are maxed out. [This can be remedied by putting the tone stack's ground (at the 6800 ohm Mid resistor mounted on the bass pot) on a switch which is called a "Raw" or "Boost" switch. Lifting the tone stack ground completely eliminates it from the circuit and gives a big boost in gain and makes the tone much more raw and tweedish. This is a great mod.] In contrast the tweed Deluxe's single tone control applies a very light signal load with minimal loss of gain. The addition of a negative feedback loop to the AB763 helps the amp hold its composure compared to the wild and wooly 5E3 Deluxe. Unlike the tweed's no gain cathodyne phase inverter, the blackface long tail pair phase inverter is a gain stage equal to approximately 1/2 of a normal triode gain stage. This added gain gives the LTP phase inverter more voltage swing to fully drive the power tubes into distortion. The AB763 power tubes use fixed bias and are at higher voltage compared to the the 5E3's cathode biased power tubes. Because of these power amp differences the Deluxe Reverb puts out about 22 watts compared to the 5E3's 14. The AB763 Normal Channel therefore has a cooler preamp but much hotter phase inverter and power amp compared to the 5E3 Deluxe. Each channel has two input jacks, a Hi and Low. The input circuit is identical to the tweed "Normal-Bright, Hi-Low" circuit. See this for an in depth discussion of the input circuit. Typical signal level from the guitar pickup coils is about 0.1 volt AC RMS (root-mean-square averaging) but can vary greatly due to the number of pickups, their design and of course how and what is played on the guitar. Quiet jazz played on a guitar with a vintage single coil pickup can produce signals below the single digit millivolt range (0.001v). The Low jacks' inputs run through a voltage divider formed by the two 68k Grid Stopper resistors which cuts the guitar signal in half (-6dB). If you find you prefer the Lo input jacks you should consider using the Hi jacks and just turn down the volume on your guitar which gives you the same signal level but you'll have control at the guitar. Each channel's Hi jack has 1 mega ohm of input impedance while the Low jack has 136 kilohms of input impedance. This impedance difference will color the tone of the guitar pickups slightly so you should sample any new guitar through both Hi and Low input jacks to see which sounds best. You can't really "jumper" AB763 channels together because the Vibrato Channel has an additional gain stage that puts the two channels' signals out of phase. If you do jumper the channels the tone will be weak and funky as the two signal streams cancel one another out. But give it a try, you may like the effect. If you mod the Normal Channel to run it through the reverb and tremolo effects the two channels will be in phase and you can jumper the channels for a fatter, thicker tone. Each channel has a 1 megaohm Input resistor on its Hi Input Jack. The Input resistors set the amp's input impedance and act as tube V1A and V2A's grid leak resistors. For best signal voltage transfer from guitar to amp we want a low impedance from the guitar and a high impedance for the amp (at least 10 times more impedance for the amp is a guide called "the rule of 10"). This intentional impedance mismatch trades guitar pickup coil current for voltage--this is called impedance bridging. 1 megaohm is a standard value for most all guitar amps so there's no reason to tweak its value. A higher value would add impedance but also add noise. A lower value would decrease noise but reduce the voltage signal (attenuate) from the guitar. Grid Stopper resistors help stabilize the amplifier by removing much of the audio signal above human hearing. The Grid Stoppers also act as 'mixing resistors' to prevent interaction between two simultaneous Hi and Lo inputs like two guitars or a guitar and microphone. The Hi input uses both 68k grid stoppers in parallel so the grid stopper resistance is actually 34k. Grid stop resistors on the first amplifier stage do remove some high freqs from the guitar signal so some modern amps use smaller grid stoppers and some amps do without them altogether. If you never run two simultaneous inputs into one channel you may want to reduce the value of the grid stopper resistors. You can temporarily bypass the grid stopper resistor to see how it sounds. Just use an alligator clip wire to jumper around the grid stopper resistor to try the amp with lower or no grid stopper resistance but the difference is very subtle and only affects very high frequencies but it may add some "sparkle." The optimal location for a grid stopper resistor is on the tube grid (input) pin itself so there's no bare wire after it to act as a radio antenna to pick up radio frequency interference (RFI). Click the image to view the full size (readable) layout. A schematic shows electrical flow while a layout diagram shows the physical location of the amp's components. You can download a PDF version of the layout. In the 50's and 60's carbon composition resistors were used and if you want your amp to look 'period correct' then use them but metal film resistors generate 1/10th the noise of carbon comp so use them if you want the best quality audio and lowest noise. Resistors generate the white noise hiss you hear when the amp is turned up to max with no guitar plugged into the amp. The input and grid stopper resistors are a good place to use metal film resistors because their hiss will be amplified by every gain stage. After going through the grid stopper resistors the audio signal flows down the wire to the preamp tube's pin 2 (control grid), which is the entry to the 'A' half of the preamp tube (V1A). It's called V1A because tubes were called 'Valves' and this is tube number 1 and we're using half of the tube, the 'A' triode. A triode has three electrodes, a grid, cathode and plate (anode). 7025 is the type of tube (low noise 12AX7) and it's really two tubes in one (dual triode). The grid is the 'control valve' that controls the flow of electrons through the tube. The AC guitar audio signal charges the grid positively and negatively as the signal voltage alternates. A positive grid will allow electrons to flow from the cathode, through the grid to the plate. A negatively charged grid will slow the flow of electrons through the tube. See How Tubes Work for more info on how they amplify guitar audio. Click on the layout to see the hi-res version. Download the pdf here. Download the DIYLC file here. Notice how tube V1B and V2B have only one shared cathode resistor valued at 820 ohms. It is shared so the cathode resistor is approximately half the value of a cathode resistor used for a single triode such as V1A's 1.5k cathode resistor. Two triode circuits sharing one cathode resistor will pull twice the current through it so you have to cut the resistance in half to get the same voltage drop across the resistor. The voltage drop across the cathode resistor puts the cathode at a positive voltage compared to the control grid. The cathode voltage is normally around +1.7 volts DC. This voltage difference is the triode's bias. Some modern high gain amps bias their preamp triodes cooler using a 2.7k cathode resistor or bias it hotter with an 820 ohm resistor. Both will reduce headroom and boost preamp distortion. Increasing the cathode resistor value also reduces gain and decreasing the cathode resistor value will boost gain. The 820 ohm cathode resistor is fully bypassed with a 25uF 25v cathode bypass capacitor. A bypass capacitor allows the AC guitar signal to bypass the cathode resistor and significantly boost gain. A 25uF bypass cap is large enough to bypass all guitar frequencies but many modern amps use a bypass cap as low as .68uF (680 nano Farads) to boost only mid and high freqs. The V1A preamp amplifies the guitar audio signal then sends it out pin 1 (plate) to the Tone Stack. Note that both channels' tone stacks are identical. All three tone stack capacitors act as coupling caps which keep the high voltage DC on the V1A plate from flowing downstream. The tone stack uses a 100k slope resistor, treble, bass and mid capacitors, a Treble pot, Bass pot and a 6800 ohm Mid resistor to filter the AC guitar audio signal. The tone stack's low impedance is a heavy load on the audio signal. Both channels' tone stacks are identical. The stack's output flows directly into the Volume pot. The 6800 ohm Mid resistor is equivalent to a 10KL Mid pot set at 68%. If you are considering modifying the tone stack I recommend you download the free Duncan Amps Tone Stack Calculator so you can see graphically what the modifications do and how the Treble and Bass pots will react to the new component values. Once you get the Tone Stack Calculator running click on the Tone Stack Calculator's "Fender" tab at upper left. By setting the Mid slider (bottom left) to 68% you get 6800 ohms to equal the Deluxe Reverb's fixed 6800 ohm Mid resistor. You can double-click any component in the tone stack schematic to change its value so it's easy to see what happens to the control movements when you change the 100k slope resistor to 56k or adjust the value of the Mid resistor. The frequency response graph on the right will change as you alter component values or move the Bass and Treble pot sliders. Just playing with the pot controls and watching the graph will show you a lot about the interactive nature of the TMB (treble mid bass) tone stack. The Tone Stack Calculator is a very cool tool. The Tone Stack is a series of three RC (resistance capacitance) audio filters that block three bands of audio frequencies. The Treble and Bass pots change the resistance of the RC audio filters to change the amount of signal filtered out. The blackface tone stack is a passive filter so it cannot boost any frequency band, it can only remove parts of the guitar audio signal. Note the Treble pot is wired as a variable voltage divider (potentiometer) while the Bass pot is wired as a variable resistor (the input and wiper terminals are tied together). In AB763 amps with a Mid pot it is wired as a variable resistor too. The AB763 amp circuit places the tone stack very early in the amplification chain so it has a greater effect and offer's more control over the substance of the overdrive tone. A small tone tweak can have a dramatic effect on an overdriven signal. If you play a lot of overdrive you should consider adding a late-in-the-circuit tone control such as a Vox style Cut Control. A late tone control allows a fine tuning of the overdrive tone to eliminate ice pick highs without affecting the meat of the tone. The guitar signal leaves the tone stack at the treble pot's wiper and flows to the Volume pot which is wired as a variable voltage divider (pot is short for potentiometer). Turning down the volume pot bleeds guitar signal to ground. The volume pot wiper sends the audio signal directly to the V1B grid for another round of preamp amplification. V1B is fully bypassed by a 25uF 25v cathode bypass cap for maximum gain. The signal leaves V1B at its plate and flows through a relatively large .047uF coupling capacitor or 'cap.' Coupling caps are sometimes called 'blocking caps' because they block DC (direct current) voltage. DC current flows in only one direction where AC (alternating current) alternates its direction of flow--the electrons actually change direction and move back and forth through a circuit. High voltage DC power used by the tube is brought in through the 100k Load resistor. Load resistors change the amplification stage from a current amplifier to a voltage amplifier. For more information on how the Load resistor does this see this. Although the AB763 circuit doesn't use them, many modern amps have load resistor bypass capacitors to remove frequencies above human hearing to stabilize the amplifier and prevent oscillation. You can also remove "ice pick highs" with a load resistor bypass cap. The wire between the tube plate and the load resistor carries up to 280 volts DC. This wire carries the AC audio signal out while simultaneously bringing in the high voltage DC power the tube needs to function. Coupling capacitors allow the AC audio signal to pass through but block the high voltage DC and keep it from flowing into the following amp stage. How capacitors block DC but let AC pass: Caps are actually made with sandwiched conductive plates but I like to visualize them as having a stretchable rubber membrane inside that blocks the flow of electricity. When voltage is applied to a capacitor the 'rubber membrane' stretches and bulges as electrons try to flow through it. The higher the voltage the more the membrane bulges. If you quickly reverse the capacitor's voltage polarity it will go from bulging one way to bulging the other way. This is what a small AC signal does--it stretches the 'membrane' back and forth as the voltage alternates which allows electrons on both sides of the capacitor to move back and forth (alternate) but a constant DC voltage that is trying to flow in one direction will be blocked by the membrane. Capacitors are made of two conductive plates separated by an insulator or dielectric. The cap above uses paper as the insulator. Common insulators (dielectrics) are mica, polypropylene, ceramic, and even paper and oil. The AB763 Normal Channel uses .047uF coupling caps which are half the size of the 5E3 Deluxe's very large .1uF coupling capacitors. Using .047uF caps trims and tightens the low end and reduces "farting out" which the 5E3 is famous for. In contrast the Vibrato Channel uses a 50% smaller .02uF coupling cap. Modern, high gain amps use extremely small coupling caps (0.0022uF) to reduce bias drift, blocking distortion and keep the overdrive tone tight. See the Tube Amp Overdrive page for more info. 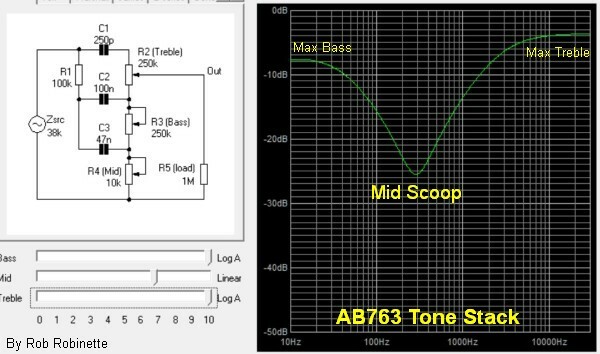 Some people lower the value of the AB763 coupling cap in only one channel and leave the other channel alone so you can choose between standard AB763 blackface or a tighter, more modern tone. Smaller coupling caps can also improve the way the AB763 works with hot humbuckers and FX pedals, especially gain, boost, delay and reverb pedals. Another way to modernize the AB763's low end and tighten up the amp is to reduce tube V1A's or V2A's cathode bypass capacitor. Both have a 25uF 25v cap that is large enough to boost all guitar frequencies. After the coupling cap the guitar audio signal flows through a 220k mixing resistor. The Vibrato Channel also has a 220k mixing resistor. These two resistors prevent interaction between the two channels when their signal streams are merged just before the phase inverter. The signal then flows to V6, the Long Tail Pair (LTP) Phase Inverter (also called cathode-coupled phase inverter). The LTP phase inverter is the most popular phase inverter in guitar amplifiers due to its large output voltage swing and sweet overdrive tone. Unlike the non-amplifying cathodyne phase inverter in the 5E3 Deluxe the LTP phase inverter not only creates a dual mirror image signal stream but it also acts as a gain stage boosting the signal by about 1/4 of what two normal triode gain stages would. This added gain gives its output more voltage swing to drive power tubes to a fully distorted state. The LTP is a true differential amplifier and uses both halves of a dual triode tube. When a positive voltage signal arrives at the LTP phase inverter's upper grid the reduction of blocking negative electrons on the grid allows electrons to flow from its cathode, through the grid, to its plate. The electrons flowing onto the plate lowers the plate voltage--this is the inverted and amplified output signal. As electrons leave the upper cathode a positive voltage is created on the cathode (scarcity of electrons = positive voltage) caused by the voltage drop across the cathode resistor. This positive signal voltage is also present in the lower cathode because the two cathodes are directly connected. Since the lower grid is held constant at 0 volts AC, any change in its cathode voltage will create a voltage difference between the grid and cathode. This voltage difference changes the flow of electrons from the cathode, through the grid to the plate. As the lower cathode goes positive (scarcity of electrons) fewer electrons will flow from it through the grid to the plate. The reduction of electrons flowing onto the plate raises the plate voltage--this is the non-inverted and amplified output signal. See How the LTP Phase Inverter Works for more info. After the phase inverter the guitar signal flows through another coupling cap to block high voltage then to the 1.5k power tube grid stopper resistors. They help filter out noise above human hearing to prevent oscillation but they also perform another important function, they help control blocking distortion to keep the overdrive tone sweet even when pushed very hard. Like all grid leak resistors you can use the power tube grid leak resistors value to control the input signal voltage. A larger value grid leak will attenuate the signal less and a smaller value will attenuate the signal more. Typical power tube grid leak values are 100k (Marshall) and 220k (Fender). The power tubes, V7 and V8, are sometimes referred to as the output tubes. While the preamp tubes have three electrodes: Cathode, control grid and plate (a tube with 3 electrodes is called a triode) the power tubes are pentodes with five electrodes: Cathode, control grid (g1), screen grid (g2), suppressor grid or beam forming plates (g3) and plate. The screen grid is held at a constant, high positive voltage to help pull free electrons from the cathode, through the control grid to the plate. The suppressor grid helps prevent electrons from bouncing off the plate. It is tied directly to the cathode. The 6V6 and 6L6 were named "beam tetrodes" by their inventor for patent reasons but they are really pentodes. Like the control grid stopper resistors the 470 ohm screen grid resistors help prevent oscillation but they also prevent tube damage from excessive screen grid current. The 6V6GT is a beam pentode and therefore flows little screen current so the AB763 can get away with smallish 470 ohm 1 watt screen grid resistors. If you like to push your amp hard an upgrade to 470 ohm 3 watt grid resistors is a good upgrade. If you want to run non-beam, true pentodes like the EL34 then you should install 1k 5 watt screen resistors. Screen grid resistors will also increase the screen voltage drop when screen current flows which will increase the amount of power tube distortion caused by screen voltage drop. The power tubes are the final stage of amplification. Where the preamp tubes are voltage amplifiers, V7 and V8 are power amplifiers (power = voltage x current) and their output is expressed in watts. The guitar signal enters at pin 5 (control grid) and leaves via pin 3 (plate) and flows through the output transformer (OT). The AB763's two power tubes are set up for push-pull operation. One power tube "pushes" current through the output transformer while the other power tube "pulls" current. The output transformer's primary and secondary windings are really just two wire coils wrapped around an iron core. The input, or primary coil winding uses alternating electric current flowing through the coil to generate a magnetic field or flux. This magnetic field fluctuates with the AC signal voltage. The magnetic flux flows around the transformer iron core to the secondary coil which generates (induces) a voltage in the secondary coil winding. You can alter the voltage and current from primary to secondary by changing the ratio of coil wraps from primary coil to secondary. 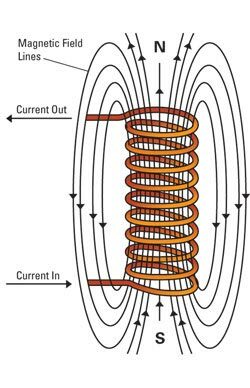 Current flowing into the primary winding induces magnetic flux flow around the transformer core which in turn induces an electric current in the secondary winding. Put fewer wire wraps on the secondary (output) winding and its voltage will decrease (step down) but its current will increase. 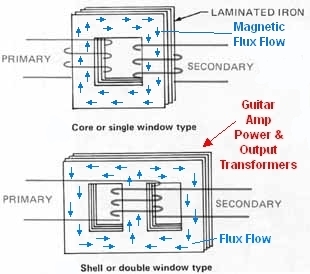 Most guitar amp transformers are of the 'shell' type (bottom of diagram) and made with laminated iron magnetic cores. Example: The primary winding has 200 wraps of wire in its coil and the secondary has 100 wraps. If a 10 volt 1 amp alternating current is applied to the primary winding the secondary will generate 1/2 of the voltage but twice the current so 5 volts and 2 amps would be put out by the secondary winding. This is what an amplifier's output transformer does, it steps down the signal's voltage but steps up the current because the speaker's voice coil needs current to move the speaker cone. At high volume the Deluxe Reverb's output transformer reaches saturation which tends to compress the signal. Once saturated an output transformer can't flow any more flux or get any louder so loud notes are capped but softer notes are still amplified so there's less volume difference between loud and soft guitar notes. Upgrading the Deluxe Reverb to a larger, higher watt rated output transformer will boost maximum volume and reduce compression (the output will be more dynamic, accurate and solid state sounding)--but some of the Deluxe Reverb's magic lies in its high volume compression. The output transformer's primary takes in a high voltage, low current signal (high impedance) and puts out a low voltage, high current signal (low impedance). Typically about 350 volts of swing (350 volts peak-to-peak and 124 volts RMS) from the power tube plates flow into the output transformer primary and about 13.3 volts AC RMS (37.5 volts AC peak-to-peak) flows out the secondary wires to the speaker jack and on to the speaker. The AB763 circuit uses Negative Feedback (NFB) tapped from the output transformer secondary (speaker wire) and injects it into the phase inverter at two places: the lower phase inverter triode grid and at the base of the phase inverter "tail" resistor. The input at the tail resistor helps balance the NFB signal effect between the two phase inverter outputs. NFB reduces distortion, increases headroom and improves stability but a drawback is it also reduces overall amplifier gain. NFB also tightens the transition from clean to distortion. The 5E3 tweed Deluxe has no NFB and has a wide, lazy transition from clean to dirty. The AB763 has a lot of NFB so it jumps from clean to dirty. This transition affects touch sensitivity and playability. An 820 ohm negative feedback resistor reduces the output transformer voltage to a suitable level before it joins the amp's signal stream. It's negative feedback because the signal is out of phase so when it's injected into the amp's signal stream it reduces the amp's signal voltage. Adding a switch to the NFB circuit is a common modification. Reducing or removing feedback makes an amp more aggressive with earlier break up and distortion at lower volume levels. The Vibrato channel has a third preamp gain stage and the phase inverter is also a gain stage (the 5E3 phase inverter gives no gain). Why doesn't the Vibrato Channel sound like a gain monster then? Because the Vibrato Channel's preamp is cooled by the high load tone stack, the tremolo circuit also loads down the guitar signal and a crap ton of NFB is injected at the phase inverter. You can liven up the amp by cutting the NFB signal in half by increasing the 820 ohm negative feedback resistor to 1.6k. I like to use a 3-way NFB switch with normal/none/half settings. Another common gain boosting mod is to switch out the tremolo and remove its load. The speaker jack has a built in switch that grounds the output transformer's secondary when no speaker is plugged in. It does this because if you power up the amp with no speaker connected the output transformer will generate very high voltage in the secondary winding and fry itself. The ground switch on the jack gives the transformer secondary a closed, short circuit which it can handle much better than an open circuit. Always have a speaker connected to a tube amp when you power it up. The aux jack is tied directly to the main speaker jack's tip and ground. Because of the main jack's ground switch you must have a speaker plugged into the main jack for the aux jack to function. You should use an 8 ohm aux speaker along with the cab speaker which will give the amp a 4 ohm load which Fender considers safe for the amp. A 4 ohm aux speaker will give the amp a too low load which will reduce output and stress the power tubes. From the speaker jack the signal moves on to the speaker. The alternating current audio signal flows through the speaker's voice coil which generates a magnetic field. The voice coil is simply a single wire wrapped into a coil as shown below. The magnetic field created by the voice coil is either attracted to or repelled by the speaker's magnet. 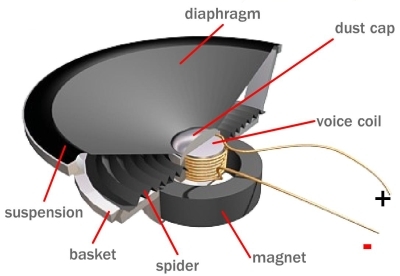 Positive voltage in the voice coil generates a repulsive magnetic force and the speaker coil and cone moves outward away from the speaker magnet. Negative voltage generates an attractive magnetic force and pulls the speaker cone inward. The speaker cone alternates between moving outward and inward as the guitar signal voltage alternates between positive and negative. Electric current flowing through the speaker's voice coil generates a magnetic field. When the audio signal electric current reverses the magnetic field also reverses causing attraction and repulsion to the speaker magnet. This in and out movement of the voice coil and speaker cone creates air pressure waves that our ears perceive as sound--the sweet sound of electric guitar. For every movement of a guitar string the amplifier generates a corresponding movement of the speaker cone. When the speaker cone moves outward a positive air pressure wave is created and when the cone moves inward a negative (low pressure) wave trough is generated. These air pressure waves move our ear drums in and out. The ear drum movement is translated into neuron activity which is sent to the brain where pleasure is created, thus electric guitar + amp = pleasure. The 'voice coil' is an electromagnet that interacts with the speaker magnet. The 'spider' supports the voice coil but allows it to move in and out freely. So the main purpose of the AB763 Deluxe Reverb guitar amplifier is to take the tiny electrical signal generated by the guitar's pickup and make it strong enough to push and pull a speaker cone. The guitar amp is also used to shape the tone and control distortion giving us the clean, mellow sound of jazz guitar or the animal growl of hard rock. Distortion is an important part of guitar amplifier design and this is the primary difference between guitar and audio amplifiers. Audio amps are usually designed for absolute minimum distortion. See Tube Guitar Amplifier Overdrive for specific information on how overdrive distortion is created. Input : V2A preamp1 : tone stack : volume pot with bright cap : V2B preamp2 : Reverb Mix Resistor : V4B preamp3 : Tremolo circuit : V6 LTP phase inverter : V7 & V8 fixed bias power amp. The extra preamp gain stage gives the Vibrato Channel more gain than the Normal Channel. I will just point out the differences between the Vibrato and Normal Channels. The AB763 Vibrato Channel is slightly brighter than the Normal Channel because of the addition of a tiny 47pF (pico Farad) Bright capacitor or Brite cap, which allows high frequencies to bypass the Vibrato Volume pot at lower volume settings. The lower the volume the more highs are bypassed so the Vibrato Channel is usually preferred for lower volume playing. Using a larger value Bright cap will allow lower frequencies to pass around the Bright Volume control. The Fender 5F6A Bassman used a 100pF Bright Cap so only very high freqs were passed around the volume control. Many modern guitar amps use a 250pF Bright Cap. After the second preamp gain stage the audio signal flows through a .02uF coupling cap. This is half the size of the Normal Channel coupling cap and filters out some low frequencies which helps tighten up the low end and keep the overdrive tone cleaner and tighter. It also helps keep the reverb wet signal cleaner. This coupling cap can be reduced to .0022uF (one tenth the normal size) to tighten the tone and make the amp even more pedal friendly. 1. It flows down to the reverb circuit where it is processed and becomes the reverb "wet" signal. 2. It flows up through the 3.3M ohm Reverb Mix resistor. This resistor has a tiny 10pF (pico Farad) bright cap across it that allows high frequencies to bypass the Reverb Mix resistor to prevent the big resistor from dulling the tone. All of the dry guitar audio signal must flow through the Reverb Mix resistor or its bright cap. The reverb wet signal is cut by 68% by the voltage divider formed by the 470k Attenuation resistor and the V4B 220k Grid Leak resistor. The reverb wet signal is mixed with the dry guitar signal on the downstream side of the Reverb Mix resistor. The now mixed dry and wet guitar audio signals are amplified by the third stage preamp V4B. The preamp is fully bypassed with a 25uF 25v cathode bypass resistor. Notice V4B's small 220k grid leak resistor. Normally a preamp's grid leak is a 1 mega ohm resistor. Fender used the 220k resistor to attenuate the signal to limit the gain from this stage. Bumping the 220k resistor to 1M could be a worthwhile mod to increase the Vibrato Channel's overall gain (I have not tried this mod). The Vibrato Channel's signal then flows through a 220k mixing resistor (same as the Normal Channel) then on to the phase inverter. Note the gain factors of each stage are not additive because there are signal voltage losses between gain stages. If there were no losses a 37mv signal into the amp would yield 65.5 VAC at the speaker jack. Old school spring reverb literally uses springs to delay and replicate a signal. Reverb simulates the reflected sound from a room's interior. In the schematic below the audio signal enters on the upper left and flows through a 500pF Reverb Filter capacitor which filters out most of the guitar signal's low frequencies. Low frequencies are too long and turn to mud when reverb is applied. The filtered signal then gets boosted by the Reverb Driver amplifier. The Reverb Driver is needed to generate the power to physically move the reverb springs. After the Reverb Driver the amplified dry signal is then sent through the Reverb Transformer which transforms the high voltage, low current (high impedance) signal from the Reverb Driver into a low voltage, high current (low impedance) signal. Amplified current is needed to drive the reverb tank input transducer. The tank's Input Transducer is simply an electromagnet used to move the spring. The amplified audio signal flows through the input transducer's coil which generates a magnetic force. The magnetism generated in the coil is alternately attracted to and repulsed by the transducer's magnet which makes it and the attached springs move. The movement travels down the Springs and causes movement of the Output Transducer magnet at the other end. The Output Transducer's moving magnet's magnetic field cuts through the transducer's output coil which generates the 'wet' reverb signal voltage. In other words, the Input Transducer transforms electrical energy into mechanical movement to shake the springs. The output transducer transforms the mechanical movement back into electrical energy. The weak wet signal generated by the output transducer coil is then amplified by the Recovery Amplifier and flows through the Reverb Level pot and back to the amplifier. An easy way to increase the maximum wet reverb intensity is to decrease the value of the 470k Attenuation Resistor that's just after the Reverb pot. It forms a voltage divider with the 220k V4B Grid Leak resistor and sends a lot of reverb signal to ground. The 470k Attenuation Resistor is located on the circuit board upper center next to the 3.3M Reverb Mix resistor and its 10pF Bright cap. You should only consider this mod if you need more wet signal in the mix when the reverb control is maxed out. Signal enters tank on left and exits on the right. The Input Transducer's coil moves the transducer magnet which moves the springs which moves the output transducer magnet which generates the reverb signal voltage in the output transducer coil. V5A is the oscillator on the left and V5B is the tremolo driver on the right. The AB763 tremolo circuit acts as an automatic wavering volume control and acts directly on the guitar audio signal. The guitar signal is tapped just before the 220k channel mixing resistor and phase inverter. The tremolo circuit bleeds the guitar audio signal to ground by a light dependant resistor (LDR) in the opto-isolator (or opto-coupler, often called the 'roach' because it looks like a bug). The opto-coupler is made up of a neon light bulb and a light dependant resistor. [We could call the neon bulb V10 because it is a single electrode tube ;) ] When the neon bulb is dim the LDR is at high resistance and less guitar signal is bled to ground. When the neon bulb is bright the LDR resistance is low and more signal is bled to ground. The triode on the left is the Oscillator and its grid is connected to its plate through three oscillator caps that cause the plate and grid voltages to oscillate. The plate voltage oscillation flows to the grid of the triode on the right, the Tremolo Driver. The Tremolo Driver amplifies the oscillation to drive the neon light bulb. The oscillating current from the driver tube plate runs through the neon light bulb causing it to oscillate in brightness from bright to dim. As the brightness of the neon bulb changes the output volume of the amp changes with it. The Intensity control (lower right in schematic above) alters the amount of the guitar signal that is sent to the light dependant resistor (more signal sent to the LDR = more intense tremolo). The Speed control (upper center) alters the resistance in the first oscillator RC (resistor capacitor) pair which changes the RC's capacitor charge time which changes the tremolo circuit's oscillation frequency (more resistance = slower charging = slower tremolo). The Tremolo Pedal control provides the ground needed for the oscillator to operate so if no tremolo pedal is plugged in the tremolo is off. Note how the -55 volt power tube bias voltage is used as the oscillator tube's grid leak to jump start the tremolo oscillation when the foot switch is closed (turned on). An open foot switch (off) puts the oscillator grid at -55 volts which shuts down the oscillator by stopping all flow through the triode. A closed foot switch instantly removes the -55 volts from the oscillator grid and this sudden change in grid voltage instantly jump starts the oscillation. These amps use a 12AX7 as a tremolo oscillator with a very high supply voltage of 415V, a large 220k plate load resistor and 2.7k cathode resistor. The following circuit has an impedance of 429k. The 12AX7 datasheet lists the maximum plate voltage as 300 volts. This is the hottest 12A*7 gain stage I know of. An extremely high supply voltage, large value plate load resistor and cathode resistor yield a voltage gain of 64, not that much higher than the typical gain stage's 58. This gain stage is near center bias at -2.3 grid volts allowing a swing from 0 to 4.6 grid volts before saturation or grid clipping occurs. For information on how these lines were charted see How to Draw Load Lines. This stage is pushed well beyond the max plate voltage of 300 volts but the tubes hold up well. Now that we've covered the signal flow I'll go back and cover the other amplifier components that I didn't mention. Wall plug power of 120 volts AC (or 100, 220 or 240 volts AC in other countries) runs through the fuse and on to the power switch. The fuse is a 1 amp slow blow fuse. Slow blow means it won't blow instantaneously when the turn-on power surge runs through it. Sustained current greater than 1 amp is required to blow the fuse. 120 AC volts RMS (DC equivalent average) wall power equals 339.4 volts peak-to-peak. After the amp's fuse and On/Off switch the 120v AC runs to the power transformer (PT), through its primary winding, then back to the wall plug via the white neutral wire*. The power transformer has three secondary windings. The first winding steps the 120v AC up to 660 volts AC. Two other small secondary windings step the 120v AC down to 6.3 volts AC and 5 volts AC (notice all voltages output by transformers are always AC). The 6.3 volts is used to power the pilot light and heat the preamp and power tubes' heater filaments which heat the tubes' cathodes. The 5 volts is used to heat the rectifier tube's cathode. *Bonus Info: When I first learned that the power transformer primary coil was made up of one long wire that directly connects the 120v hot wire to the neutral (ground) wire I wondered why it didn't short out. The reason is the primary and secondary coils are coupled together by the transformer's iron core. Alternating current in the primary coil creates a magnetic field or flux that is captured by the core. That flux flowing around the core creates an AC voltage in the secondary coil. The load (impedance) placed on the secondary winding by the amplifier is transferred through the core to the primary coil. That impedance keeps the primary coil from "shorting out." The power transformer high voltage secondary is rated at 330-0-330 volts AC RMS. The 0 means the transformer has a grounded 0 volt center tap and the transformer puts out +330v on one wire while simultaneously putting out -330v on the other for a 660v AC RMS voltage wire-to-wire which is equal to 1,867 AC volts peak-to-peak! The 660 volts AC RMS power from the power transformer is fed directly into V9, the GZ34 rectifier tube. V9 is a full wave dual plate rectifier tube that converts alternating current (AC) into direct current (DC), which the amplifier's electronics actually need to function. The power transformer and rectifier tube have internal resistance that cause voltage sag when higher current is demanded. Installing a higher current rated power transformer can reduce voltage sag and "stiffen" the amp's tone, make it sound "punchier" and help tighten the bottom end. Approximately 420 volts of DC flows out of the rectifier tube's pin 8 (cathode) and is referred to as "A" voltage by Fender but by convention it would also be called B+ or B+1 (from old Battery Positive designation). In the blackface amps Fender labeled the high voltage power supply nodes A, B, C and D but they are also referred to as B+1, B+2, B+3 and B+4 by many amp techs. The Deluxe Reverb runs at about 60 volts higher than the 5E3 Deluxe. Higher amp voltage tends to increase output power, tighten up the tone and make it "punchier." The power supply of the Deluxe Reverb is slightly under rated in current output compared to other AB763 amps such as the Twin Reverb. This under rating leads to dynamic voltage sag that adds touch sensitivity and enhances playability. The downside of the underrated power supply is the loose low end that can get "farty" when pushed hard. The A or B+1 DC voltage flows to two 16uF 450v filter caps then on to the standby switch. Keep in mind that these two filter caps will hold their charge if you turn off the standby switch before turning off the power switch. It is safer to leave the standby switch on (amp powered) when you power down the amp so all the filter caps will discharge through the circuit. Increasing the size of these first two filter caps is a common Deluxe Reverb modification that will tighten the amp's bottom end and reduce farting out. Replacing the first two 16uF caps with 22uF caps works well and won't strain the rectifier tube on startup. All five of the 16uF 450v filter caps are located in a "dog house" outside the chassis next to the output transformer. The doghouse filter capacitors and dropping resistors form RC (resistance capacitance) low pass filters that along with the choke take the lumpy, pulsing DC output of the rectifier tube and smooth it out--the smoother the better. Any waves or ripples left over in the DC power would be added to our audio signal and heard as 120Hz hum in the preamp and power tubes. The filter caps and choke also act as a power reservoir so the larger the value of the choke and capacitors the "stiffer" the amp sounds because the amp can react to power demands with less voltage sag. Low frequencies demand more power so larger capacitors can really help the low end and prevent "farting out." 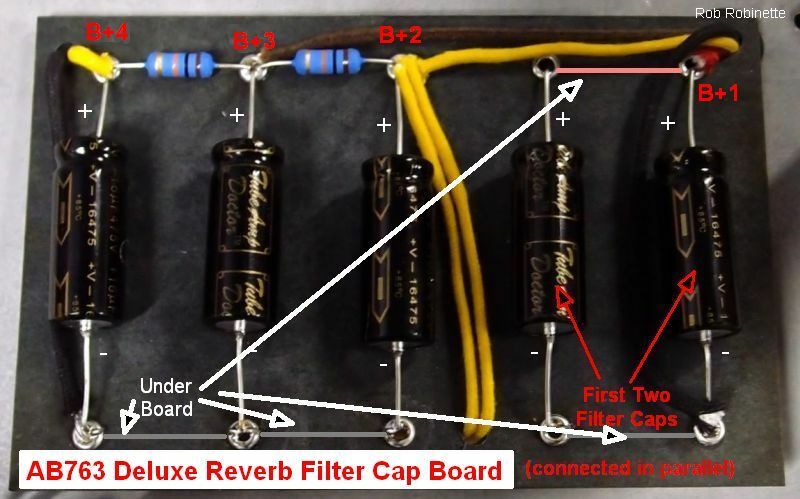 First two filter caps on the right are connected in parallel in the Deluxe and Deluxe Reverb. All of these caps would be 16uF from the factory. All of the other AB763 amps are wired differently, see the picture below. After the standby switch the DC current flows to the output transformer's primary winding and to the choke. The choke does a better job of filtering AC ripple voltage than a filter cap and resistor. The magnetic field generated by the choke actively fights voltage fluctuations like noise and hum but lets DC current pass unmolested. The choke firms up the power supply by using it's magnetic field as an energy reservoir so it reduces voltage sag. All of the amp's DC power except that used by the output transformer is filtered by the choke. The 415v DC flowing out of the choke is called "B" or B+2 voltage. After the choke the DC current flows to three more doghouse filter/reservoir capacitors and two voltage dropping resistors. Notice the two 10k resistors between the filter caps, these are voltage dropping or step down resistors that reduce the 415 volts B or B+2 down to 325 volts "C" or B+3 then down to 280 volts "D" or B+4. 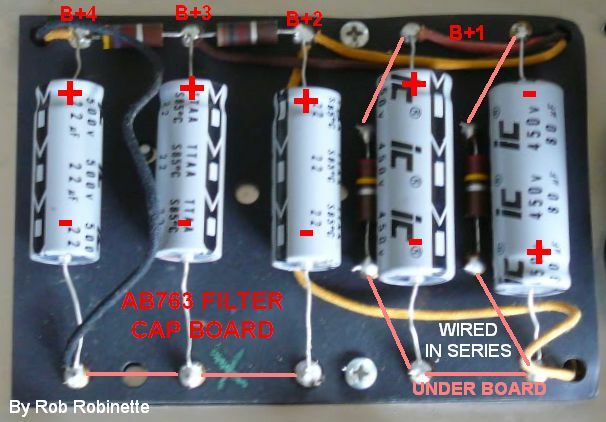 The AB763 amps other than the Deluxe and Deluxe Reverb have their first two filter caps on right wired + to - in series. The "A" voltage from the rectifier is tapped off to feed directly to the output transformer's primary center tap which feeds the power tube plates. The "B" voltage is connected to the power tubes' screen grids but it also powers the reverb transformer, tremolo oscillator and tremolo driver. The "C" voltage powers only the phase inverter. The "D" voltage is used to power the preamp and reverb recovery triodes. The filter capacitors and voltage dropping resistors also decouple the four power nodes to prevent interaction, feedback and oscillation between the amp's stages. You can raise or lower the "C" and "D" voltages by adjusting the value of the voltage dropping resistors (smaller resistor = higher voltage). Calculated 6.3V filament current: (2 * 6V6) + (6 * preamp tubes) = (2 * 0.45) + (6 * 0.3) = 2.7A Power usage is 2.7A * 6.3V = 17 watts. B+ current is supplied by the power transformer's high voltage secondary. Preamp tube current is so low it isn't necessary to actually calculate the value so we can simply estimate it at 3.6ma per triode (2 triodes per preamp tube). Transformer voltage: 330-0-330 volts AC RMS. The 0 means the transformer has a grounded 0 volt center tap and the transformer puts out +330v on one wire while simultaneously putting out -330v on the other for a 660v AC RMS voltage wire-to-wire. Rectifier_Efficiency: Solid state full wave diode: 1.37, GZ34: 1.36, EZ81: 1.30, 5U4B: 1.28, 5Y3: 1.25 Note: Perfect rectifier efficiency would be the square root of 2 or 1.41. Loaded_Voltage_Drop = Unloaded_B+ * 7% = 449V * .07 = 31.4V The amp load on the power transformer and rectifier will cause a voltage drop during operation. How far it drops is dependant upon the output transformer's current rating and the rectifier used. A transformer operating near its max current rating can't refill the filter (reservoir) capacitors as quickly as a larger, higher rated transformer so the voltage will drop more. Typical Deluxe Reverb loaded, idle B+ voltage is around 420V DC. The Unloaded_B+ voltage will drop around 7% in a typical amp. Notes: Calculated_Ideal_Load is the ideal plate-to-plate impedance of the output transformer. ^2 means squared. Note: Total amp power output. B+ is the max plate voltage and 30V is the minimum plate voltage for a fixed biased amp, so B+ -30 is the maximum plate voltage swing. 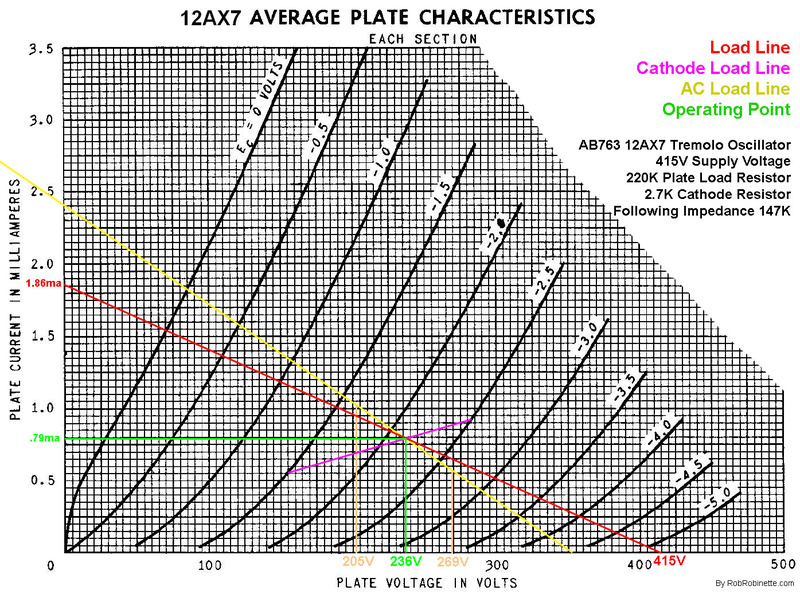 For a cathode biased amp we would use 100V for the minimum plate voltage. So a AB763 Deluxe Reverb power transformer must supply at least 1.9 amps of 5V rectifier heater current, 2.7 amps of 6.3V current for the tube heaters and 92.7 milliamps (0.0927 amps) of B+ current. It uses 9.5 watts of 5V, 17 watts of 6.3V and 38.7 watts of B+ for a total of 65.2 watts, less than a 75 watt light bulb. The no-reverb blackface Deluxe was available at the same time as the Deluxe Reverb. The AB763 circuit without reverb. Tremolo is at left center. Note the Vibrato channel does not have the third preamp gain stage but it does have a Volume pot mounted bright cap and the larger .1uF coupling cap like the Deluxe Reverb. This amp uses two less preamp tubes by cutting the reverb and third preamp gain stage. The AB763 Deluxe Reverb's immediate predecessor, the 6G3 brownface Deluxe, had no reverb and used bias wiggle single triode tremolo. Note the tweed style volume-tone controls. This type of tone control puts much less load on the first stage preamp so the preamp is hotter than the AB763 Deluxe & Deluxe Reverb's channels. 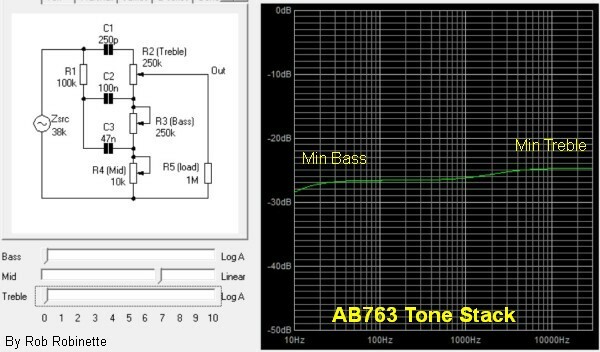 The use of 220k plate load resistors in both channels' first preamp stage generate more gain than the AB763's 100k's. Both 6G3 channels use a .02uF coupling cap while the Deluxe Reverb uses a 100% larger .047uF in the Normal Channel. The 6G3 uses a long tail pair phase inverter and fixed bias power tubes like the AB763. Tremolo circuit at bottom left. Note both channels have a 500pF "bright cap" across the volume control but the Bright channel's tone cap is twice the Normal channel's size at .02uF. The Normal channel also has a .002uF plate load resistor bypass cap which darkens the Normal channel's tone. 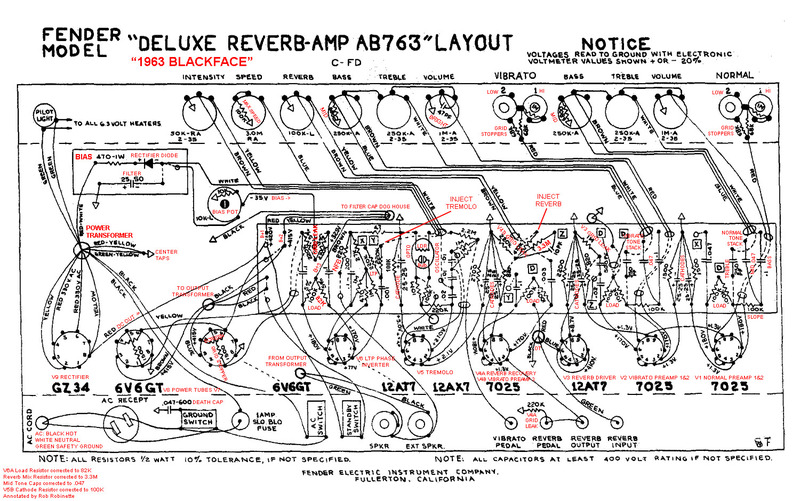 Click image for clean schematic. Bias is non-adjustable because adjusting the bias will change the intensity of the tremolo which is the major weakness of bias wiggle tremolo. Bias wiggle creates the tremolo (volume modulation) effect by modulating the power tube bias. The brownface Deluxe does not have power amp grid stopper resistors. This leads to earlier power tube grid current flow and grid clipping which colors the overdrive tone. The 6G3 is a very cool amp that offers a tweed style tone control with black face style circuitry and makes an excellent kit build from Mojotone. The build is only slightly more complex than a 5E3 and offers up a much less idiosyncratic tone. The AB763 circuit on a PCB. Click the image for the full size schematic. Click the image for the full size layout. Some of the major differences between the Twin Reverb and Deluxe Reverb are highlighted. 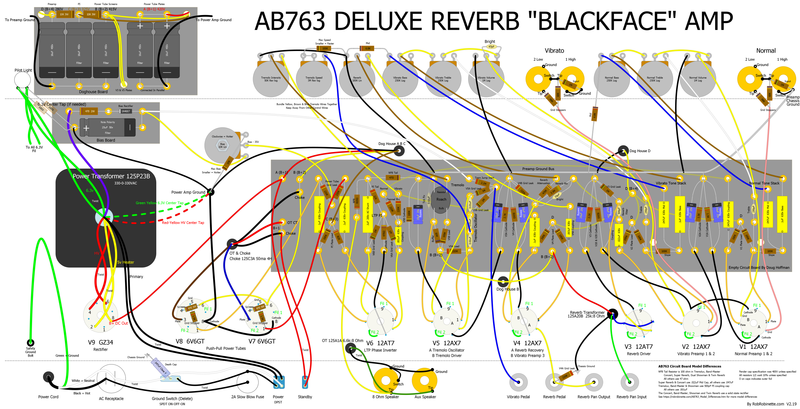 See the AB763 Modifications page for more blackface amp information. 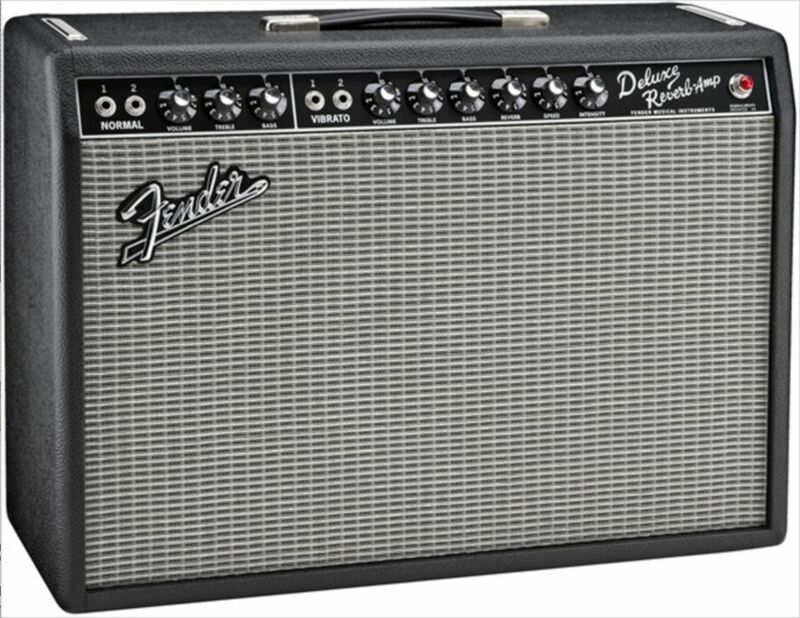 If you are a Deluxe Reverb fan see the Evolution of the Deluxe & Deluxe Reverb Amplifier. I'm a fan of mojotone.com and they have AB763 blackface Deluxe Reverb, Super Reverb and Twin Reverb kits available. Doug Hoffman of Hoffmanamps.com sells AB763 turret boards and small parts kits.